Beoordeeld door gasten na hun verblijf bij Poseidon Studios. 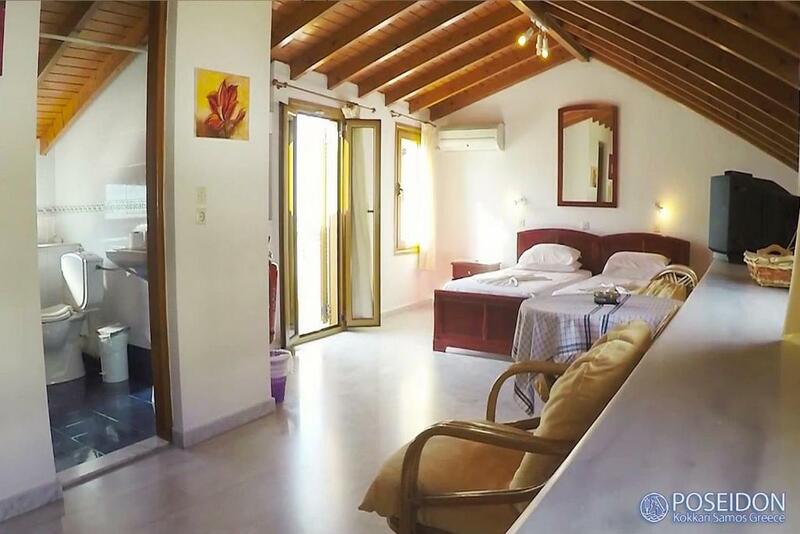 Nice, spacious studio with a lovely view over Kokkari. 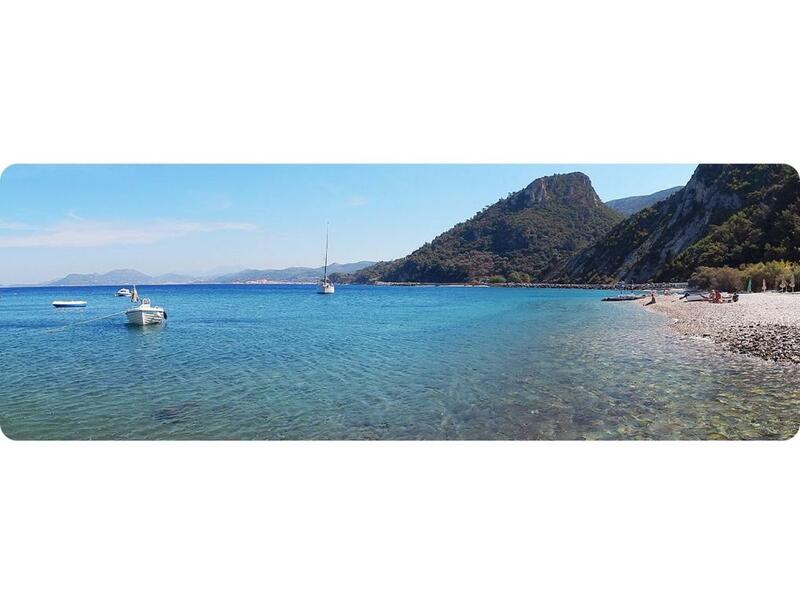 Quiet area near the lovely Calma beach. Very welcoming hosts and delicious fish at their seafood restaurant. Very nice family owned hotel and restaurant with great well prepared Greek cuisine. Great value for money and I was lucky to get upgraded to a room with balcony over the seaside as well due to availability. Spyros and his family and staff was very customer friendly and helped and took care of us during the stay. The Hotel and Restaurant is in end of Kokkari harbor which means its not that load and much people as the center of the harbor. Perfectly located to reach the beaches by foot (2 min) and restaurants is just next to it. Had an amazing week - will be back! Super trevlig familj, boende nära vattnet. Nytt å fräscht. Hosts were incredible. Very helpful in all ways. Assisted with parking, luggage, breakfast included. The room was comfortable and large. Included a bedroom, bathroom, living/kitchen/dining area. Great view of the sea overlooking pedestrian walkway. Would definitely stay there again! Also have a restaurant below the accommodations, excellent food. Verzeker uzelf van een geweldige prijs voor Poseidon Studios - door recente gasten met een 9,1 beoordeeld. Poseidon Studios ligt aan de rand van het dorpscentrum van Kokkári. Het complex biedt accommodaties met eigen kookgelegenheid en uitzicht over de baai van Kokkári. Het complex heeft een traditioneel restaurant en gratis WiFi in het hele pand. De lichte studio's zijn voorzien van airconditioning, houten meubilair en een eigen balkon. Elke studio heeft een kitchenette met een waterkoker, een minikoelkast en een koffiezetapparaat. De studio's zijn uitgerust met een kluisje en een eigen badkamer met een douche. Restaurant Poseidon is ingericht in de traditionele stijl van Samos. Het restaurant heeft handgemaakt meubilair en borduurwerk. U kunt genieten van een breed scala aan lokale gerechten, verse vis en zeevruchten. Het dichtstbijzijnde strand bereikt u in 2 minuten lopen. In 15 minuten rijdt u naar Vathy, de belangrijkste stad en haven van Samos. De luchthaven van Samos bevindt zich op 18 kilometer afstand. Er is gratis parkeergelegenheid in de buurt van Poseidon Studios. Poseidon Studios verwelkomt gasten van Booking.com sinds 5 jun 2012. Wanneer wilt u verblijven in Poseidon Studios? 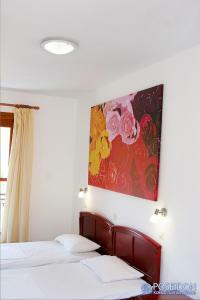 Our Studios apartments are situated on a hilltop at the edge of the village's center. The Studios apartments are perfectly set in a location only 20 meters away from the beach and 10 meters away from the Hotel. 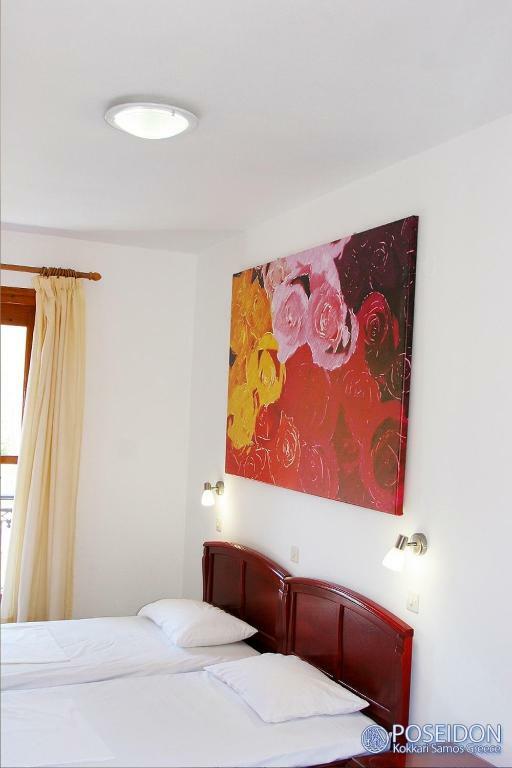 The Studios apartments are categorized as a 3 star Samos hotel and consist of 7 spacious guest apartment rooms with kitchen facilities. All the rooms have their own balcony with a view of the village. In May 2009 our renovation project was completed. The Studios' authentic design reflect earthly color tones throughout the rooms, with wood, marble and glass materials effectively combined. The large glass balcony doors allow ample sunlight to flood into the rooms. Managing the property since 2005. We have renovated to modern standards. Equipped with all the essential for a comfortable stay. 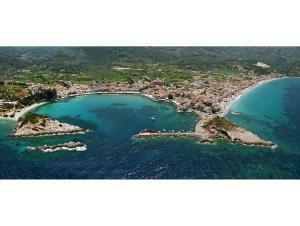 We are located on the Greek island of Samos in the Northern Aegean Sea. The building is composed of 6 studios and two restaurants. Unspoiled beaches and crystal clear waters make your stay a truly magical experience. Spend your day swimming, snorkeling, wind surfing, diving, exploring the island walking or taking one of our organized tours. In the evenings you can enjoy a romantic candle-light dinner at our restaurant and then relax at the beautiful harbor. 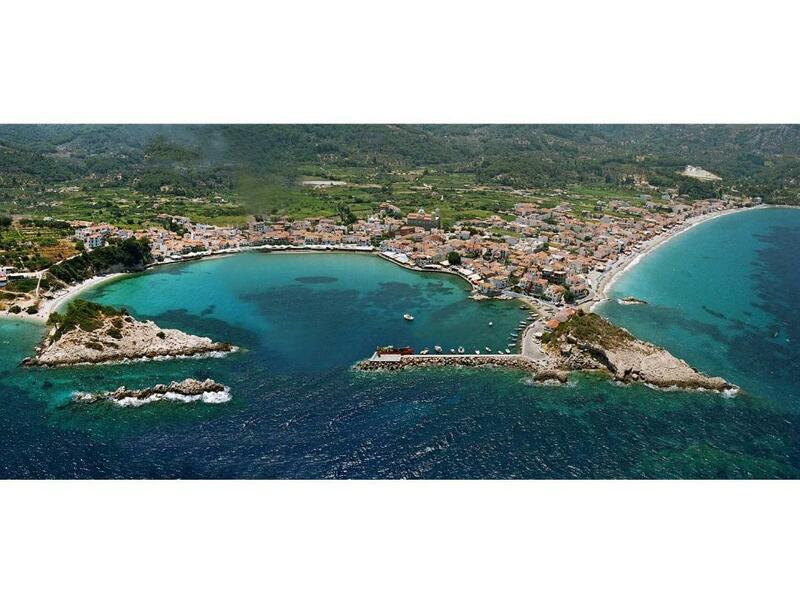 Our village, Kokkari is designed in a traditional Mediterranean Eastern way and located on the northern part of the island, 10 km distance from Samos town. Founded on the plains of Mt Karvounis, nesting between two protective headlands that form the most picturesque gulf of the whole island. The village's position is unique because it combines mountain and sea. On the mountain you will feel at peace, relaxed, you’ll enjoy the interesting forest footpaths, the wild flowers’ sweet smells, the spring's freshness and the birds’ singing. From up high, the houses of my village look like small white doves embraced by thousands of trees. The view is breathtaking. 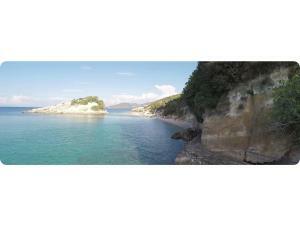 However allow me to say that, the sea will also charm and captivate you. 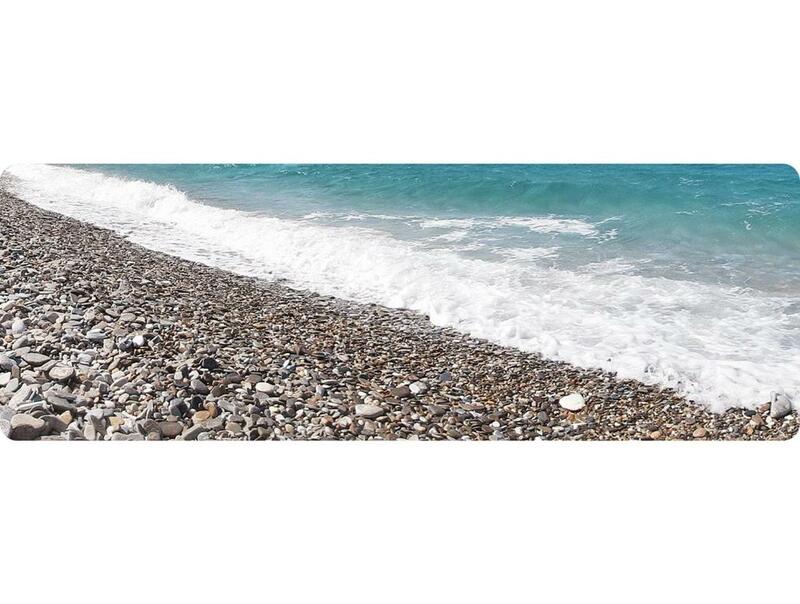 The pebbles lie next to the sea forming the most beautiful beaches of my island. On coastal streets you’ll find friendly hotel owners, traditional tavernas, local restaurants and entertainment. In my village, there are around 300 habitants, all of them are jovial and good-hearted people. We accept visitors with pleasure, always willing to offer them our hospitality so that they become members of the family. Huisregels Poseidon Studios accepteert speciale verzoeken, voeg ze toe bij de volgende stap! Voor alle extra oudere kinderen of volwassenen geldt een toeslag van 12 EUR per nacht voor het gebruik van extra bedden. Laat Poseidon Studios van te voren weten wat uw verwachte aankomsttijd is. Tijdens het boeken kunt u het veld Speciale Verzoeken gebruiken, of u kunt rechtstreeks contact opnemen met de accommodatie met behulp van de contactgegevens in de reserveringsbevestiging.